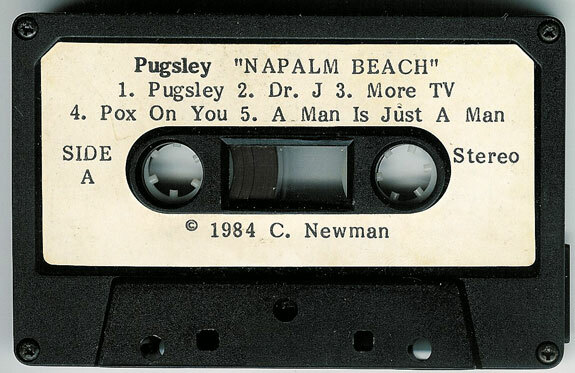 Napalm Beach PUGSLEY transfer from the original 4-TRACK DIY album on cassette, FREE DOWNLOAD (MP3 or high-quality sound files) on bandcamp! CLICK HERE!!! DO IT! THIS ALBUM ROCKS!!! This album was recorded in drummer Sam Henry’s mother’s garage on 4-track and distributed on cassette, mostly at shows, in Portland and Seattle. Thank you Jeff Larson of Sonic Recollections, Portland, Oregon for buying this cassette in 1985, and digitizing it in 2011. This tape is amazing! Its really cool to hear the early versions of songs later re-recorded… Like “just one day”. Really dig the early sound too… Thank you jeff larson for transferring this lost classic, and thank you skullman for making it available! Never thought there was any chance of hearing it, and am surprised what an essential piece of the chris newman puzzle that it is…. More tv… Pox on you… Its solid from front to back. Along with rock and roll hell and teen dream (and moving to and fro as well, tho it seems to me that album marks more of a transition into napalm beach’s later sound), these first three napalm beach albums hold up very well against other classic portland albums of that era (or any era actually). Thank you again for making this little heard and largely unavailable recording available! Its far better than I had imagined. Unbelievable the wealth and quality of chris newman’s body of work… And now with pugsley and the new reissue of rock and roll hell… I hope others will make these exciting discoveries… Does anyone know what songs were to appear on the original napalm beach ep, of which according to the discography, a test pressing was produced? Were any of the songs released as napalm beach originally played/recorded as the untouchables? So much of the newman discography has been largely unavailable and difficult to track down even when originally released, that recent efforts to make as much of it available as possible is yielding such amazing finds… To the point that any history of early portland “punk” would need to be drastically revised. Thanks again for pugsley! Really really cool! This cassette takes me back to the many nights that I held down a barstool at the Satyricon, lo many moons ago. While most bands in this era were becoming bland, Punk-by-numbers bands (usually with unimaginative acronym names, boring metal riffs, spikey hair and not-quite-ready-for-retail punk clothing styles), Napalm Beach were cranky out greasy, sludgey, blues-influenced rock with songs about love, death, no love, more death and substance abuse. Certainly closer to our real lives than generic, anti-Reagan posturing or songs about skateboarding. As a 15 year old in February 1985, my mind was blown then (as it is now) by seeing 69 Ways, then Final Warning, then Napalm Beach at Satyricon – a hell of a great way to kick off the process of seeing live music in the world’s greatest venue. Thanx Sam & Chris (& Dave?) for the education, then & now. Were there other songs from these same “sessions” or is what’s on the tape what there was at the time? Listening to the throbbing garage r&b of “a man is just a man”… Best album I’ve heard this year. Sick been a fan since 84!!! Never mind Satyricon, Napalm Beach was a significant part of the sountrack of my youth (very under age) at the Met. Ursula (Candy 500) and I pretty much grew up to this music. Much respect and fond memories from so many years ago.